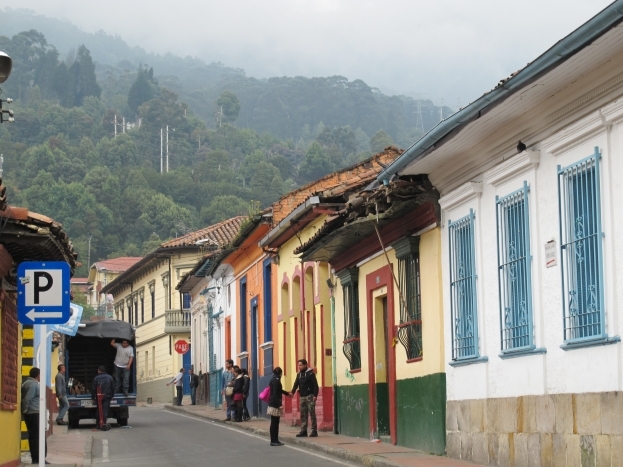 Colombia’s bustling capital, Bogota, is heaven for culture-hungry tourists. With countless galleries and museums (many for free or a small fee), as well as funky bars and restaurants, the bohemian city is one of South America’s most exciting. 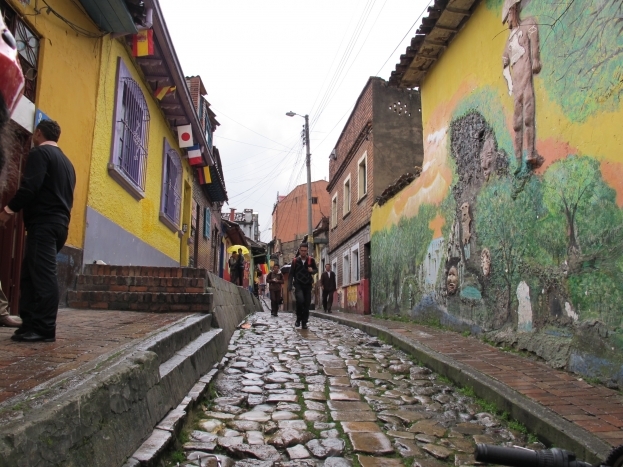 We booked four nights at the Cranky Croc hostel, which is located in the La Candelaria historical district of the city. The area is full of students and alternative young people, which makes for great nightlife and an artistic vibe. Wandering down the narrow streets, you’ll find 400-year-old Spanish houses, walls awash with graffiti and countless panaderias (bakeries) who spread the sweet smell of dough through the streets. 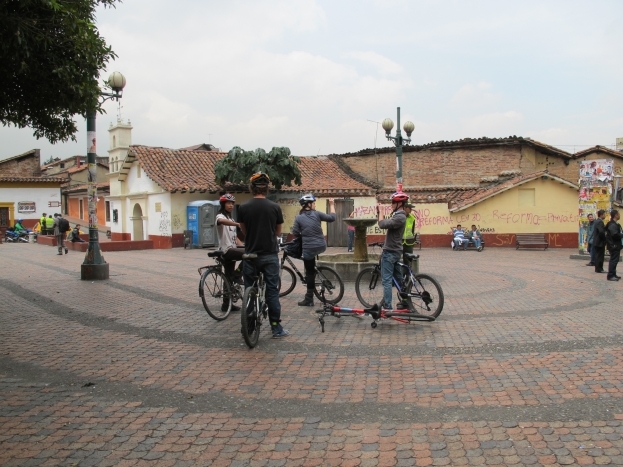 After a day familiarising ourselves with La Candelaria, we signed up for a tour with Bogota Bike Tours, hoping to explore the city in greater detail. As soon as we met our charismatic guide Juan, we knew we were in for a fun day. He refuses to wear a watch so he’s not governed by time constraints. Instead of the tour finishing at the scheduled 2pm, we didn’t say goodbye until 4pm, after an incredibly thorough tour of the city and its outskirts. 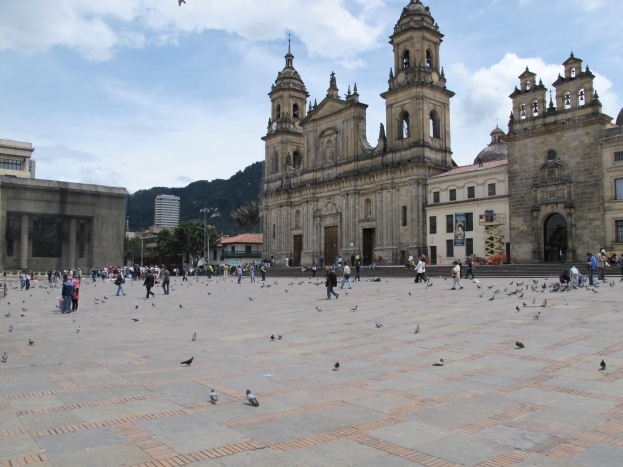 Juan’s tour began in La Candelaria – he took us to the first city square and other important monuments and buildings, stopping for quick history and current events lessons along the way. No tour would be complete without stopping at the Simon Bolivar Square. Not only is it home to the supreme court and congress, but it’s the meeting place for protests and other political events. While we were there, a lot of students were protesting against a government proposal to charge students for public university education. 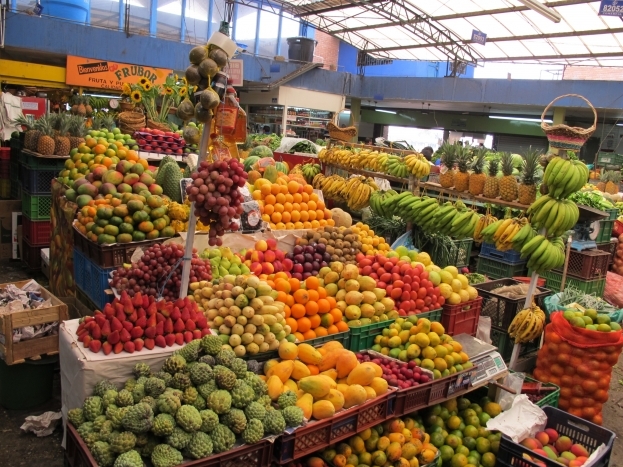 From there it was onto one of the city’s biggest fruit markets to taste all sorts of exotic fruits we’d never seen before. My personal favourite was the yellow dragon fruit, a spiky fruit filled with a sweet jelly-like centre. 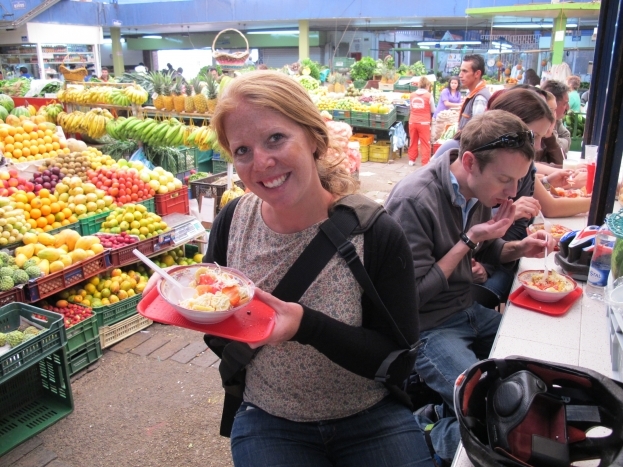 We also ordered a fruit salad for morning tea, served the traditional Colombian way – with ice-cream and grated cheese. Sounds weird but it’s actually delicious. 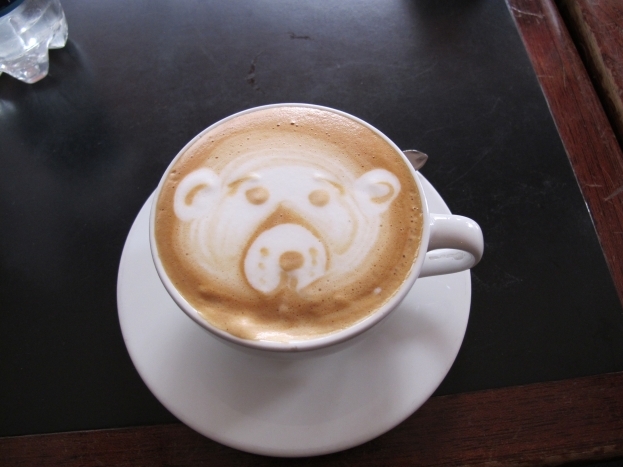 Later we called into a coffee factory where we learnt the art of roasting coffee beans before one of Colombia’s top baristas served up some artistic cuppas.